Colour table files allow the rules that map data values to colours to be stored and shared between applications. The format used here is that used by LandSerf and TreeMappa. 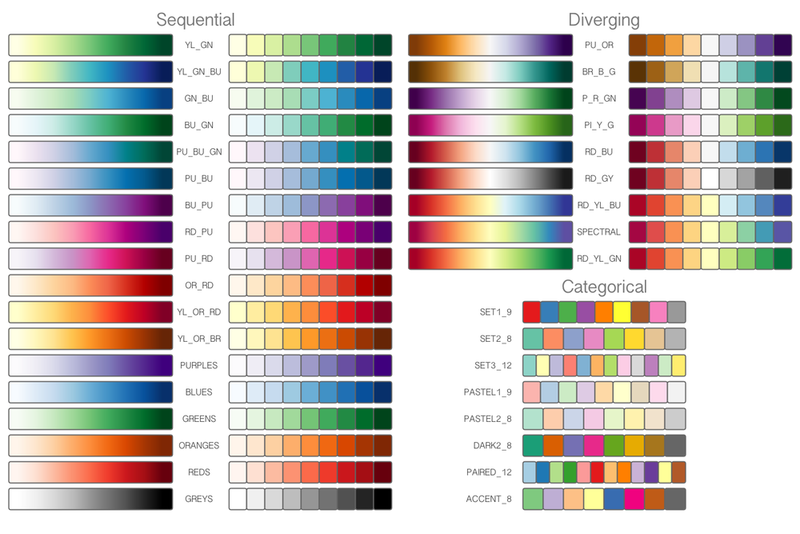 It consists of a collection of colour rules each of which specifies a data value to colour mapping. Colour rules can be discrete indicating that only the specified data value should be mapped to a colour, or continuous indicating that any a range of data values can be mapped to colours. Unlike Processing's lerpColor(), colour tables allow you to interpolate across a set of many colours rather than between just two of them. A large number of preset colour tables can be created including all LandSerf and ColorBrewer schemes. There are a number of methods available for creating colour tables, adding colour rules and opening and saving to files. For a full documentation of the methods see the ColourTable API reference. import org.gicentre.utils.colour. *;    // For colour tables. // exact matches are mapped to a colour. ColourTable cTable1, cTable2, cTable3;      // Colour tables to use. /** Creates the colour tables to display and save as files. // Create a continuous Brewer colour table (YlOrBr6). // Read in a colour table from a ctb file. /** Draws the colour tables as horizontal colour bars. // Draw the continuous Brewer colour table. // Draw the discrete version of the Brewer colour table. // Draw the preset colour table. // Draw the colour table loaded from a file. CIELab colour space is an approximately perceptually uniform space in that any two pairs of colours a fixed distance apart in CIELab space are equally distinguishable regardless of their location. The class CIELab in the colour package can convert to and from this space using the methods getColour() and getLab(). In the example below, that conversion is done with the line converter.getColour(L,a,b,false). Because not all CIELab values result in a visible colour (so-called 'out-of-gamut' colours), the final parameter of this method allows the option of extrapolating colours that fall outside of gamaut to their nearest visible colour. 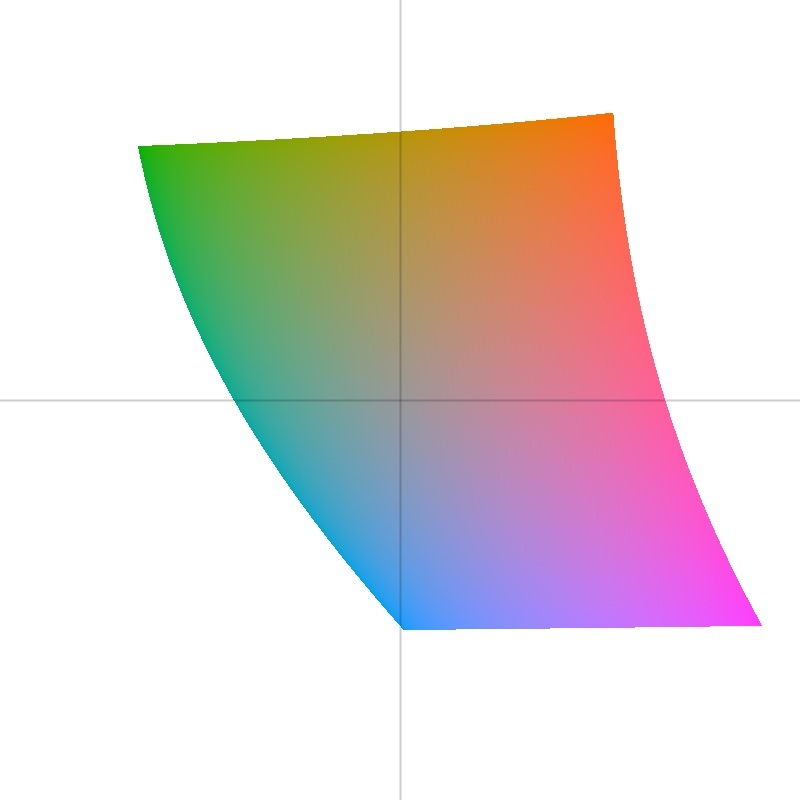 If false, out-of-gamut colours are returned as null objects, if true, the method guarantees that a visible colour is always returned, regardless of L,a,b values. Note that in processing, to convert a Java Color object into a valid Processing colour value, call its getRGB() method (see the example sketch below). import java.awt.Color;                  // For Java's color class. // Sketch to demonstrate the use of CIELab colour conversion. // Use up and down arrows to change the CIELAB 'L' value. CIELab converter;       // Does the colour conversion work. // Draw a slice through CIELab space.